The Spacklehoss Don't Do It Yourself Squier '51 Intonation Set Up. Again, we are not responsible for any damage you do to yourself, your guitar, your neighbor's fichus or your coffee grinder. Spacklehoss is a not responsible for any of your actions. For all of eternity. Have a professional guitar tech do this stuff. Proceed at your own risk! You will need a tuner. Period. Mere mortals cannot do this without a tuner. I prefer Korgs. I have a Korg DT-2 that I have had for almost 17 years. Still works great. The instructions that I followed are from the Guitar Handbook. Seriously, just go out and buy this book. Basically, what you do is tune the string to pitch. Check the note at the 12th fret and then check the harmonic at the 12th fret. The harmonic and the fretted 12th note should be the same pitch. 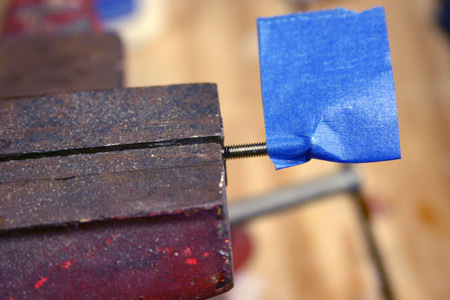 If not, adjust the saddle screw until the saddle is - farther away from the nut if the harmonic is lower than the fretted or closer for the reverse. Ideally the open string, the fretted 12th and the 12th fret harmonic should all be the same pitch. It's just that simple. Loosen the string on big adjustments. If not, you will just dig big scratches into your base plate. You can keep it in-tune for little tweaks. You also have to be aware that the saddle might not move as you adjust the screw. The screw may start to push out of the back side of the bridge. You may need to loosen the string, and pull the saddle forward, that little spring cannot push the saddle forward after a sizable adjustment. On some 51's, setting the intonation can be a challenge. I suspect that the QC people on the '51 line should have been paying closer attention to the bridge placement. It would appear that they put the bridges on a few '51s too close to the nut. 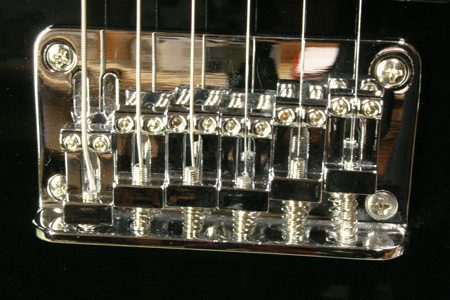 This means that the saddle screw can start to interfere with the strings and may need to be cut off. You may also need to cut the saddle springs after cutting the screws. As you can see, the low E almost ran out of room before I got the intonation right. It is completely out of the little stabilizer grooves. I had to cut the screws for the low E, D and G strings The A was just shy of interfering with the string and there was much rejoicing. I also had to cut the spring for the low E. This may look bad for the '51 but the good news is, it does not happen on all '51s and none of my others have this issue. So in the above picture I wrapped some of that cool blue 3M tape (What?! I have one of those big dispensers!) around the end of the screw so if I drop it, I can find it again. Notice I have put the end that is getting cut off in the vice, I don't care about that end. You can see my Sharpie mark on the screw, I put the mark right at the edge of the vice jaws and use them as a guide for my hacksaw blade. I used an old sharpening stone and elbow grease to clean up the cut. If you have a screw cutter that is the right thread pitch use it. BE VERY CAREFUL RE-INSERTING A HANDCUT SCREW! Make sure it is threading right! DO NOT CROSS-THREAD YOUR SADDLE! And when you cut your springs (or strings for all that matters) remember that springs and strings are hardened steel and will notch your electrical grade wire cutters. Use cutters designed for hardened steel. I have one of those Planet Waves string winder, cutter combo tools. I use it all the time. And remember kids, in a pinch, you can make your own springs out of old guitar strings. Just wrap them tightly around a small cylinder like a screw, etc. It may not be pro, but it might work if you are desperate. A new bridge or saddles may help this issue. But that is a conversation for another time.